October 4: Meet “Gotham Academy” Creators Becky Cloonan, Brenden Fletcher, and Karl Kerschl! « Little Island Comics – The Blog! A Cat-tastic Double Book Launch with Koyama Press! Maddy Kettle: The Adventure of the Thimblewitch! 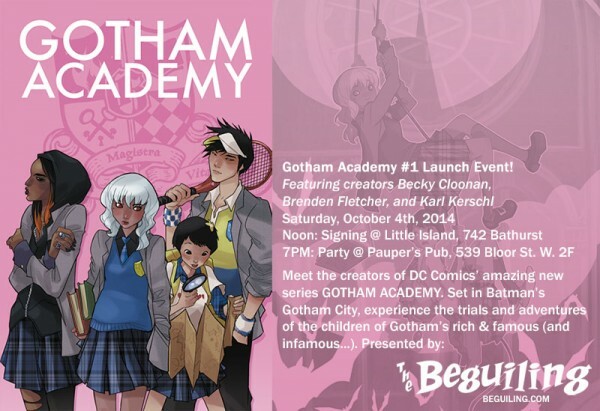 October 4: Meet “Gotham Academy” Creators Becky Cloonan, Brenden Fletcher, and Karl Kerschl! Featuring Becky Cloonan, Brenden Fletcher, and Karl Kerschl! Saturday, October 4th, 2014 – FREE To Attend! This Saturday, you’re invited to celebrate the launch of DC Comics’ GOTHAM ACADEMY #1, the newest and most unique comic book series set in Batman’s Gotham City–and the whole creative team will be on board for the party! GOTHAM ACADEMY illustrator Karl Kerschl, and writers Brenden Fletcher and Becky Cloonan, will all be on hand to celebrate the launch of the new series with us here at The Beguiling! First up, they’ll be doing a dedicated signing session at Little Island Comics from Noon to 2pm. The whole team will be signing Gotham Academy #1, as well as a great selection of their other books including Abominable Charles Christopher, Demo, and more! Bring your books to get signed! Then that evening at 7PM, come out to a party at Pauper’s Pub to celebrate the release and give the whole team a warm Toronto welcome! A short presentation will start at 7:30 (so don’t be late!). Books will be available for sale (and signed too!) but this is also a great chance to meet the creative team, and mix-and-mingle with other Toronto comic fans! Drinks will be served, refreshments provided, and a fun time will be had by all! We’ll see you this Saturday! 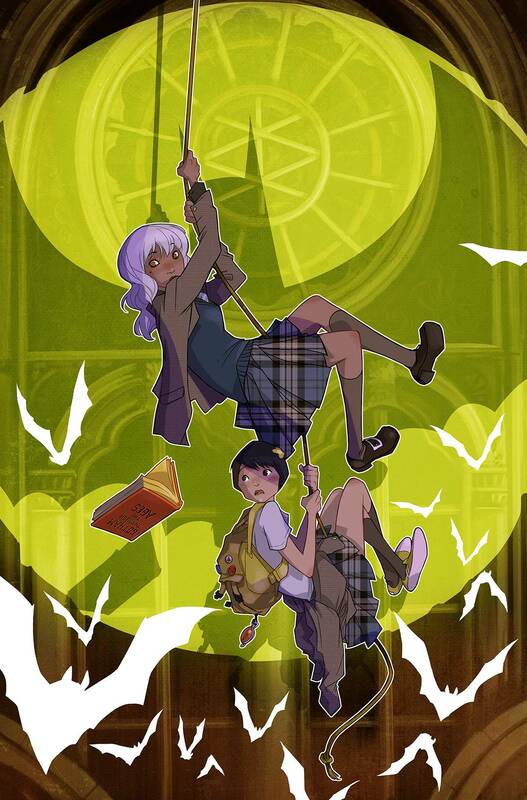 ABOUT GOTHAM ACADEMY #1: Gotham City’s most prestigious prep school is a very weird place. It’s got a spooky campus, oddball teachers, and rich benefactors always dropping by…like that weirdo Bruce Wayne. But nothing is as strange is the students!